I remember seeing a man negotiating for an umbrella on Kuta beach. He did well in the bargaining process and got the price to Rp5,000 and paid up with a Rp50,000 note. But he went away happy believing he had a bargain. Isn’t that the most important part of bargaining – to be happy with your purchase. So where can you go to spend your Rupiah? As the capital of Bali, Denpasar is the center of “market” activity for local people. The biggest traditional market stands near Badung’s river, Kumbasari market. It can give you an insight into the traditional Indonesia market where local people do their daily shopping. Fruit, vegetables and meat can be found in the basement; on the second level is the place for spices and dried goods; while household wares, clothing, art and craft is on the third level. Here you can get a very good price if you’re smart in bargaining. In the northern part is Gajahmada Street, where you can find handicrafts and some shoe shops and restaurants. In the eastern part is Sulawesi Street, the place for all kind of fabrics on its both sides with some shops providing household ware in between. The area here is very colorful with all types of material from the traditional ‘songket’ (cloth woven with strands of gold or silver) to modern day stretchy and shiny material. Why not buy your cloth by the meter and have a suit or dress made up by a local tailor. In the southern part is Hasanudin Street where you can see gold shops, selling jewelry to local people but, of course, the visitor is welcome to buy but please bargain. On the west Side of the market is the place for people to buy coconut leaf and ceremony supplies. As an international village almost all of the shops and restaurants here are for tourist market. You can find handicrafts, clothing, jewelry, CDs, furniture and leather crafts on each side of the road. But you can also see many street hawkers with their various offerings along the road. If you do not want to buy anything from them, do not make eye contact and do not ever look at their products, for if you do, they will follow you along the street and pester you to buy something. The shopping center in Sanur is on Jalan Danau Tamblingan where the situation is almost the same as Kuta but with very few hawkers. Many products are on offer in the shops and nice restaurants. The Bypass is the term for Ngurah Rai Street, perhaps the widest road in Bali. 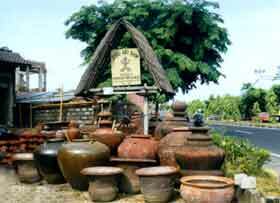 If you travel from Nusa Dua to Sanur you will see on the road has many antique, pottery, natural stone and furniture stores. You can get excellent pieces and prices if you look carefully and remember to bargain. Batubulan, on the border of Denpasar and Gianyar, is the home of stone sculptures. You can find various kinds of style here, from traditional to modern, small to large. The craftsmen can make up your order and even arrange to ship it to your address back home. On the way to Ubud you’ll pass Celuk, the place for gold and silver jewelry. The artisans in this area are well known for their quality and various designs. Huge art shops along the main road give you a chance to compare prices. This area is popular because for its Art Market. If you ask Balinese where to find art and craft with the cheapest price, they will recommend Sukawati. Here you can find cloth, paintings and statue, jewelry and also Balinese ceremonial items. This well-known village offers you fine arts with an international standard. Respected galleries such as Agung Rai, Sumertha, Rudana, Sika and Neka are recommended visiting as well as the big names of Hans Snel and Antonio Blanco. Various woodcarvings can be found in this village and its neighbors. Very colorful carvings of flowers, animals and other designs are displayed along the road. This village is the home of bamboo. The villagers create furniture and mats from bamboo; they also make some articles from lontar leaf. This village in Klungkung is popular with its own style of painting called Kamasan where a drawing is made in black ink then colored by natural pigments. Tenganan, the Bali Aga (the original Balinese people) village in Karangasem, is the only place in Bali that produces Geringsing fabric. All the material for Geringsing is taken from nature and its process is very traditional. No chemicals are used in the process. There is a legend that when dying the cloth red, human blood was used. Nowadays a vegetable dye is used. But the price of this fabric is expensive.